RHR's open letter came after the Israeli PM announced the destruction of over 400 Palestinian homes in the Israel-controlled part of the West Bank, the territory known as Area C.
"Thousands have been forced to build without permits, and great human suffering is caused when hundreds of homes are demolished each year in Area C alone,"RHR stated in their letter, adding that Israeli planning and zoning laws "severely restrict the ability of Palestinians to build homes, even on the lands that the State recognizes as belonging to them." According to the rabbis, there has been "no representation or true ability for Palestinians to determine how to properly plan for their communities since local and district planning committees were abolished in 1971. The army plans for them." In late January, the United Nations accused Israel of illegally demolishing the homes of 77 Palestinians, including many children, in East Jerusalem and the districts of Ramallah, Jericho and Hebron. “In the past three days, 77 Palestinians, over half of them children, have been made homeless,” the UN Office for the Coordination of Humanitarian Affairs (OCHA) said in a statement, adding that some of the demolished structures were provided by the international community to "support vulnerable families." “Demolitions that result in forced evictions and displacement run counter to Israel’s obligations under international law and create unnecessary suffering and tension. They must stop immediately,” the OCHA said. 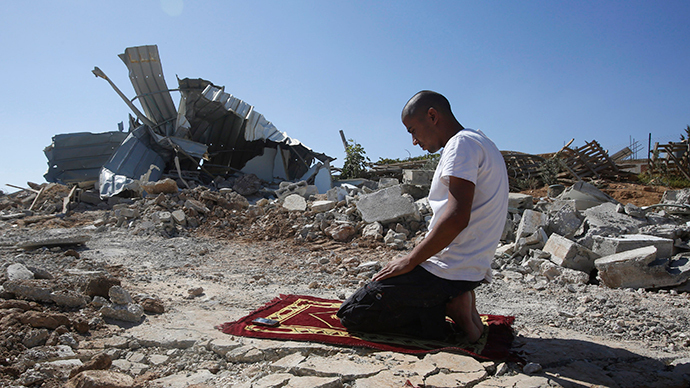 According to the UN office, during 2014 Israel carried out a record number of demolitions in East Jerusalem and Area C.
While Israel insists demolitions are carried out because homes are being built without construction permits, the UN's OCHA says the planning policies applied by Israeli authorities in Area C and East Jerusalem "discriminate against Palestinians." Palestinians are trapped in a vicious circle, where they build without permits to later have their homes razed to the ground. "Palestinians must have the opportunity to participate in a fair and equitable planning system that ensures their needs are met," the OCHA said.